With rare exceptions, until now every reaction we’ve discussed (acid-base, substitution, elimination, addition) has involved the formation of bonds between an electron pair donor (Lewis base) and an electron pair acceptor (Lewis acid) or the breakage of bonds to generate the same [this is called “heterolytic” cleavage, by the way, since one bonding partner gets two electrons and the other gets zero]. In this series of posts we’ll take a detour into a corner of organic chemistry where bonds are formed by the combination of single electrons and bonds break through “homolytic” cleavage [that is, each bonding partner receives an equal number of electrons]. As we’ll see, these reactions are generally referred to as free radicals. It all starts with a simple observation. Take an ordinary hydrocarbon gas – methane, for example, although any alkane hydrocarbon will be suitable here. When we combine this hydrocarbon with chlorine gas, in the dark, nothing happens. Here’s the interesting part. Flick a switch – or remove the cover – such that visible light can enter the flask, and suddenly our methane is consumed such that carbon-hydrogen bonds are replaced with carbon-chlorine bonds. The final product depends on the number of equivalents of chlorine gas – let’s use Cl2 in very small quantities to start with, to keep things simple. What’s going on here? Note that “hv” means “light”. [We can also do this reaction with heat alone, although it requires higher temperatures]. Before trying to understand why this happened, let’s make sure we’re clear on what has happened. Let’s look at what bonds have formed and what bonds have broken. Notice that we’re breaking Cl-Cl, C-H, and forming C-Cl. What reactions have we seen so far that would be capable of such a transformation? Well, we’ve seen that all acid-base reactions involve the cleavage of a bond between H and some atom. So maybe, you might say, it’s possible that somehow a hydrogen is being pulled off the carbon by a strong base, and then the carbon attacks chlorine. But does that make sense here? Note that methane [CH4] would have to be the acid, and chloride ion [Cl- ] would have to be the base. As we’ve seen before, this makes NO sense as an acid base reaction, because we’d be going from a very weak acid [CH4] to a very strong acid [HCl] and likewise a weak base [Cl] to a strong base. This is like trying to get Niagara Falls to flow in reverse. Not gonna happen! Furthermore, a second piece of evidence should give pause. If the reaction proceeded through some kind of charged intermediate like Cl- or CH3- , we would expect that the reaction would proceed more quickly in polar solvents [that can stabilize charge] as opposed to nonpolar solvents [which do not stabilize charge]. Instead, we find that the rate of the reaction is almost completely independent of solvent polarity. It proceeds just about as quickly in [nonpolar] carbon tetrachloride as it does in a polar solvent such as methanol. So what does this mean? It is consistent with the reaction proceeding through neutral intermediates rather than polar ones. Alright – so how, then, might we get a neutral intermediate? Let’s think first about that chlorine-chlorine bond, which is relatively weak. Imagine that by heating it up or by shining light on it [recall that light is a form of energy!] it might break somehow. How might it break? However if this was the case, then we should expect to see a faster reaction in polar solvents, which is not the case. So what else might happen here? Recall that many of the molecules we’ve been discussing have a dipole. That is, two atoms sharing a bond have unequal electronegativities, and thus unequal electron densities – one is electron rich and one is electron poor. However here we have two chlorine atoms. They have equal electronegativity. So we would not expect that one chlorine should “win” the tug of war of electrons over the other. 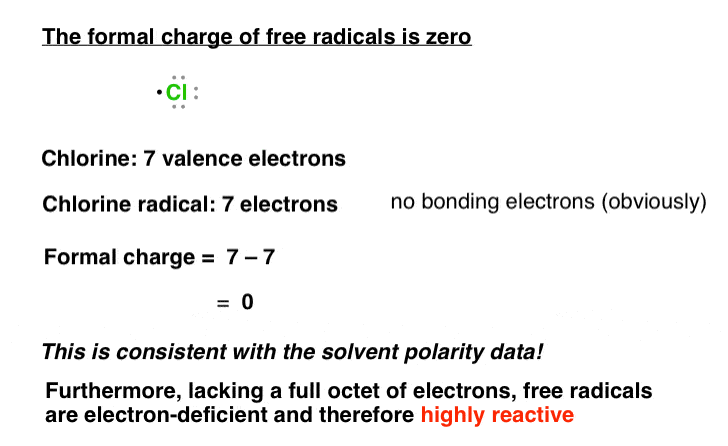 So we are left with this: What if the chlorine chlorine bond breaks such as to give each chlorine a single electron? Weird, when you first see it. One note – when using the arrow pushing notation, we modify it somewhat, such that we have single fishhooks showing where the electrons go. Note that we can use these to show a single electron going to each of the two chlorines. But let’s look at this a bit more closely. What would be the charge of the chlorine atom? It has seven valence electrons. This species is neutral, which is consistent with the solvent data. Would we expect such a species to be stable? If we think back to the octet rule, we see that each chlorine atom bears less than a full octet of electrons. In other words, it is electron-deficient. We would expect such a species to be highly reactive, since there will be a strong driving force to form the full octet. There are additional pieces of evidence collected over the past hundred-odd years to support the existence of free radicals. They aren’t crucial to understand, but if you’re curious you could try reading about EPR, CIDNP, or Moses Gomberg, the father of free radical chemistry. What factors stabilize (or destabilize) free radicals ? How do we “know” when a free radical reaction might be occurring? What useful reactions can we perform using free-radical chemistry? Thank you for making a complex concept appear to be so trivial, something myriad books and study references have failed to do.